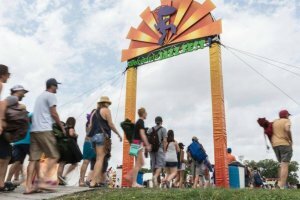 Despite its steamy reputation, the weather in New Orleans for most of the year is actually quite mild and pleasant. Winter days and summer nights and mornings often feel just as spring-like as an April afternoon. With this abundance of great weather comes the ability and the desire to spend as much time outdoors as possible. 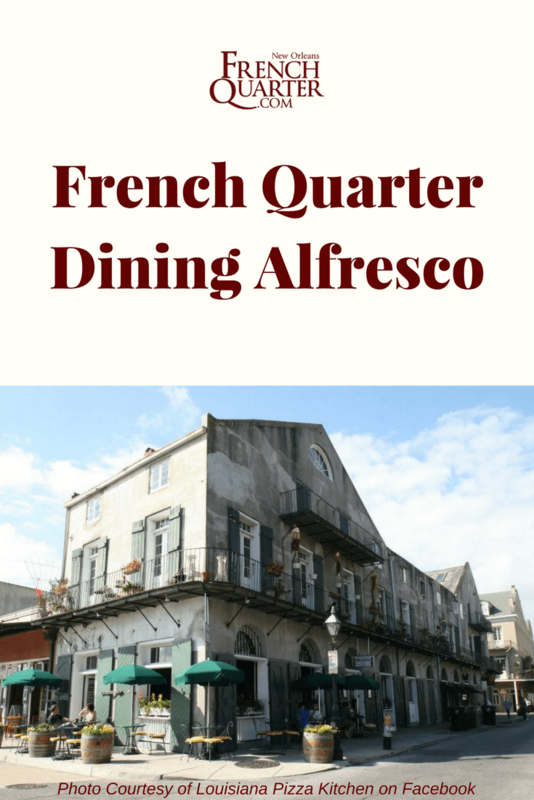 Alfresco dining combines fine dining with a Sunday afternoon picnic, and the French Quarter has many restaurants and cafes that offer a breath of fresh air. Mornings in the Quarter are filled with locals tending to their hanging gardens and shopkeepers preparing for the first customers of the day. Take a leisurely stroll to the Lower Quarter and visit Croissant D’or, a charming European-style pastry shop with extremely reasonable prices. Enjoy fresh coffee, pastries, soups, salads, sandwiches and quiches in their quiet courtyard. Is it lunchtime? Louisiana Pizza Kitchen sits just steps outside of the French Market, with sunny sidewalk tables offering a welcome break from sightseeing and bargain hunting. Gourmet, wood-fired pizza is the specialty here, with ingredients such as sun-dried tomatoes, barbecue chicken, banana peppers, Portobello mushrooms and even shrimp topping unbleached flour or whole wheat crusts. Traditional toppings are also available for the less adventurous, as well as a large selection of appetizers, fresh salads and creative pasta dishes. Pretty much anyone – but especially vegetarians – can appreciate the excellent culinary innovation at play at the Green Goddess, where all the seating is outdoors. There’s something new and creative for all palettes here, from truffled grits and poached eggs topped with crispy pork belly, but herbivores will find one of the city’s deepest menus, which includes such treats as sweet potato biscuits swimming in wild mushroom gravy. For those who prefer gumbo to gourmet, the Gumbo Shop offers all of the New Orleans favorites such as jambalaya, red beans and rice, crawfish etouffee, blackened fish, po-boys and, of course, several varieties of gumbo. This busy restaurant has a small courtyard for dining outside of the packed main dining room, and prices are reasonable. Lunch is usually less crowded than dinner, and the central French Quarter location makes an easy mid-day stop from sightseeing or Royal Street shopping. 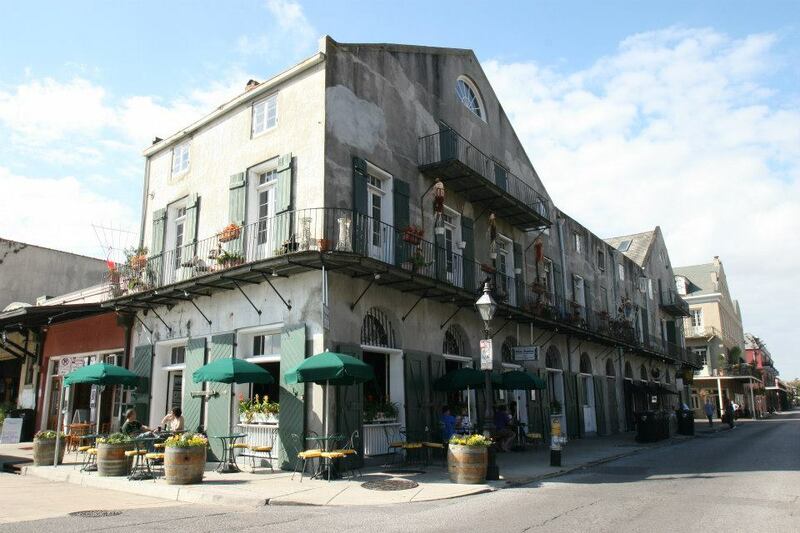 Dinner in the French Quarter is superb cuisine served in historic and charming surroundings. Muriel’s offers these things and more in an opulently restored townhouse complete with balcony dining and a courtyard bar. French doors open the restaurant to Jackson Square, just steps away. Watch the French Quarter go by while enjoying dishes such as Shrimp Remoulade with Fried Green Tomatoes, Crawfish and Goat Cheese Crepes, and wood grilled selections such as scallops, pork chops and seasonal vegetables. For dessert, the Vanilla Bean Crème Brulee is a standout. Bayona Restaurant is also located in a beautifully renovated French Quarter home, but the surroundings are more intimate. Several small dining rooms and a romantic courtyard are available for dining on Chef Susan Spicer’s creations. The Grilled Duck Breast with Pepper Jelly Glaze and the Sweetbreads with Lemon-Caper or Sherry-Mustard Butter have become almost as well known to New Orleans diners as gumbo and jambalaya. Up on Decatur St, towards the ‘bottom’ of the Quarter and the beginning of the Marigny, Cane & Table serves Caribbean-inspired small and large plates and excellent cocktails, all deliverable in one of the Quarter’s great courtyards, a tropical-chic delight that makes us want to sip a gin rickey with a twist of lime. 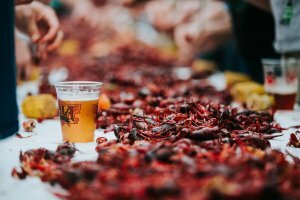 Whether it be a sunny spring morning, breezy fall afternoon or warm summer night, the French Quarter offers a bounty of alfresco dining options. The above suggestions are only the beginning – on almost every block you will find both quaint cafés and elegant bistros offering a chance to dine and soak up the classic Quarter atmosphere while actually becoming a part of it at a street side table or balcony. Explore all the Quarter has to offer and find a favorite of your own.